Last week fellow blogger Debbie at A Garden of Possibilities mentioned Adirondack Stone Works, a company that makes custom bluestone garden markers. I had wanted something like this for a while so I went ahead and ordered, second-guessing myself all the while at the indulgence. The marker was delivered today, just six days later, and it met my every expectation. I have tried it in a few places around the garden, but so far like it best in the Southern path, near the gate that leads into the main garden. 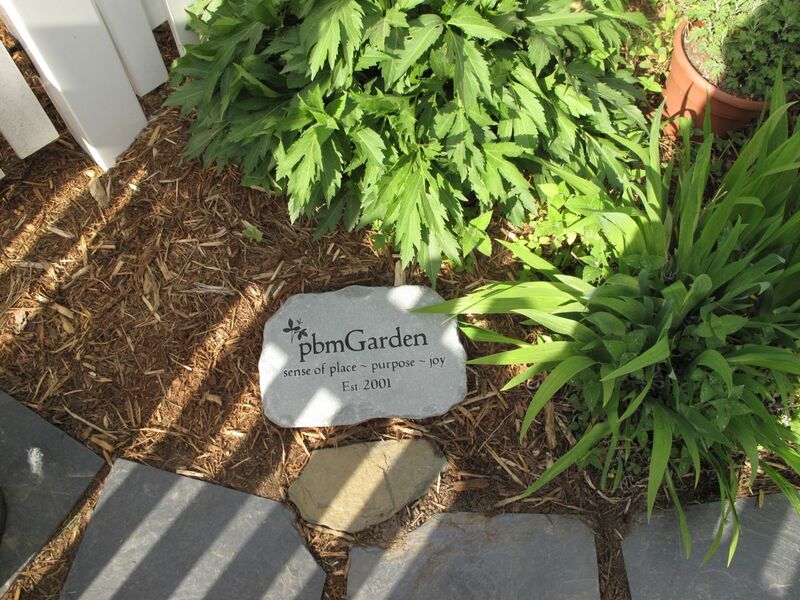 The garden marker is made of stone quarried in Southern New York State and hand-shaped. The engraving captures the theme of why I garden: Sense of place, purpose, rejuvenation and joy. I use this phrase as a tagline for this blog also. Although I chose to omit “rejuvenation” so as to simplify the wording, I know I will feel rejuvenated whenever I pass by this reminder engraved in stone. 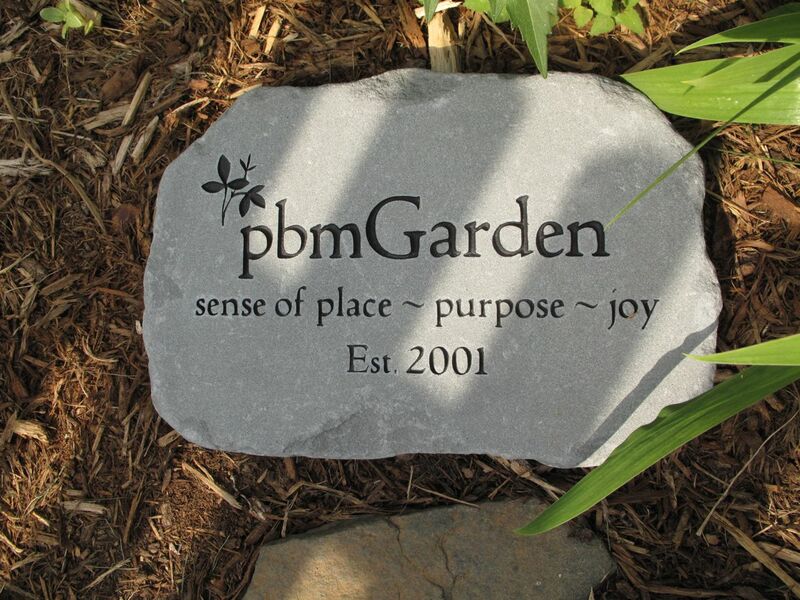 This entry was posted in garden and tagged garden marker, garden stone on April 18, 2013 by pbmgarden. Good for you! I am glad you indulged. They did a lovely job with the marker, and you will be glad you have it. Thanks for backing me up! I think I will enjoy it. Such a treasure. It will last through time just like your garden. Thanks Linda. I do like the constancy of stone. I grew up in a world where anything other than eating was an extravagance. Over the past several years I have gone through some things to convince me that life is short and it is about making yourself and others happy. I still have conflicts in this regard, buying things, but the garden marker is a definite yes. It looks quite lovely. Thanks. Really appreciate your thoughtful perspective Charlie. You captured my reservations about buying such a thing and why I’m glad I did. Have a great day! Thanks Sandra. I do too! It really is lovely Susie 😀 The words are so true as well- exactly what a garden should be. Appreciate that Cathy! The words do fit the experience I have had with gardens. Cares seems to evaporate and this will be a tangible reminder to let those worries go. I love it! it’s a great idea. Oh good–I’m really happy with the way it turned out. This company is quite a find just S of me and I hope to get a few markers..glad to hear your review. I agree it was a good find and I certainly do recommend them. If you use them I hope you’ll have a good experience too. Congratulations, that is so nice and will be with you for decades. You almost want to build something around for a display instead of laying it on the ground! I’m going to have to avoid the website you linked to…..
Haven’t quite figured out the best placement for the stone so I’m letting it visit different areas of the garden. Thank you for stopping by. Your tagline is so true to describe a garden. Thanks P&B! I came up with it at a time of needing those things more than usual and I found them in the garden.